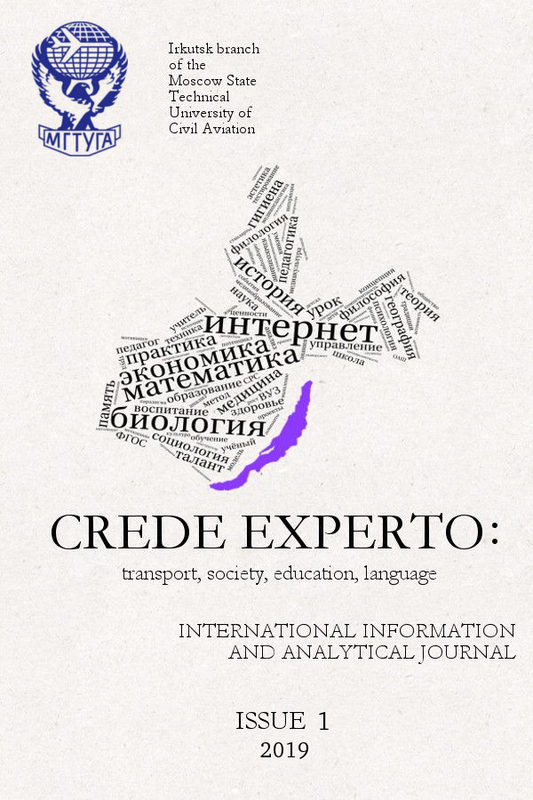 International informational and analytical journal «Crede Experto: transport, society, education, language» (IIAJ «Crede Experto»). The important results of fundamental and applied researches of the Russian and foreign leading scientists are published in the journal. At the same time the Editorials welcome unfledged researchers. The concept of the journal «Crede Experto»: transport, society, education, language is defined by the modern tendecies of the scientific search, namely a polydisciplinary character of scientific knowledge, innovative research approaches and practical significance of scientific works. The journal covers the topical issues of the modern humanitarian, natural and technical sciences. It is a multilingual (Buryat, Russian, Ukrainian, Byelorussian, Kazakh, Chinese, Yakut, Tajik, Kirghiz, Uzbek, Tatar, Polish, German, Korean, Mongol, Tuvinian, Bashkir, English, French, Spanish, Bulgarian, Italian, Japanese, Khakas, Czech) quarterly-issued scientific journal. The journal has been published since 2014. Its volume is 50 mb, formatted as a web page. The founder of the journal is the Moscow State Technical University of Civil Aviation (MSTUCA). The official site is http://mstuca.ru/. The publisher of the journal is the Irkutsk Branch of the Moscow State Technical University of Civil Aviation. The official site is http://if-mstuca.ru/site/. The Chair of the Scientific-Editorial Council is Oleg Nikolaevich Skrypnik, the Deputy Director on educational and scientific work at the Irkutsk Branch of the Moscow State Technical University of Civil Aviation, Dr.Sci.Tech., Professor, the Honourary worker of Higher Professional Education of the Russian Federation. The journal keeps the interdisciplinarity of its contents in the specified areas of knowledge. The given rubrics of the journal do not only limit the authors’s choice of themes for their publications, but also give the opportunity to wide the areas of scientific interest.